Plume Flowers are frost tender plants that are hardy in USDA Zones 9-11. If a heavy mulch is applied, they can occasionally survive in Zone 8, but will freeze back to the ground every winter. 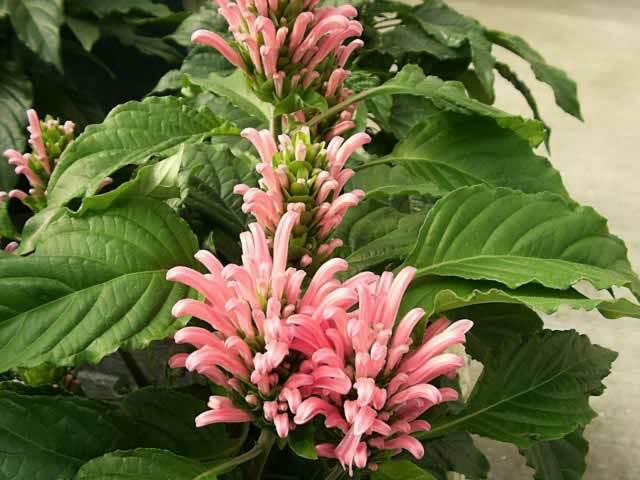 Brazilian Plume Flowers should be grown in rich, evenly moist but well drained garden soil and planted where they will be in partial to full shade in the heat of the day. Feed your Brazilian Plume plant in early spring, mid-summer and again in the early fall, using a balanced, all purpose fertilizer. Brazilian Plume Flowers are well suited for growing in containers that can be brought into the house during the winter months in colder regions. When growing as a House Plant, your Brazilian Plume Flower should be grown in bright indirect light during the growing season (Spring through Fall), with a room temperature of 60°-75°. In the dormant winter months, move your plant to a cooler (55°) room where it will receive the full sun of a south facing window. Keep the soil moist at all times but never soggy, and feed every two weeks with a good all purpose fertilizer from March through October. Set the planter on a tray of moist stones to provide added humidity. pruning should be done early in the spring so flower display is not reduced. Early in March prune your plant back hard, to about 8" or 12". Hard pruning will help to produce a fuller, multi stemmed plant. Brazilian Plume Flowers are very easy to propagate with 8"-12" softwood cuttings or 2"-3" tip cuttings. before striking them in moist potting soil. Plume Flowers can be started indoors from seeds. Justicia seeds require light for germination, so do not cover them up!